Perfect for your school, daycare, office or home, the innovative ECR4Kids school stack chair is built for comfort and durability. The stack chair features a molded seat with vented back for comfort, reinforced ribbing in back and under the seat for added strength, and steel lower back support. There is no penetration through the seat surface, so nothing will get caught. School stack chairs come with your choice of matching powder coated chair legs for a more playful appearance or chrome legs for a sleeker look. 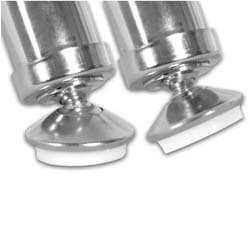 Glide options include nylon swivel glides for use on hard surfaces or matching ball glide for use on carpeted floors. Each pack of chairs includes four attractive colors: blue, red, yellow, and green. Students learn significantly better when they are comfortable. 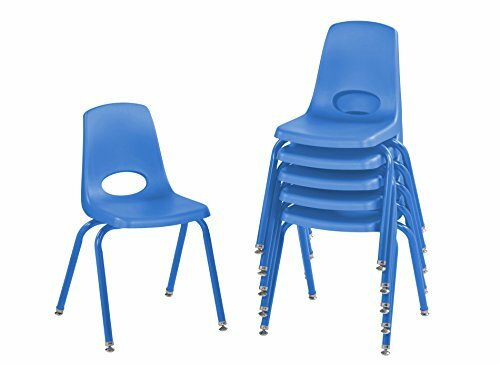 The ECR4Kids school stack chair with molded seat and vented back is designed for long-lasting comfort. Seats have a smooth and solid surface with no penetration of screws, preventing long hair and clothing from snagging. Reinforced ribbing and steel lower back support allows students to sit comfortably for longer. At the end of the day, chairs wipe clean for easy sanitation. Color in the Classroom...or any Room! Bring the rainbow into your room with this custom assorted set including brightly colored blue, red, yellow, and green school stack chairs with eye-catching matching powder coated legs or chrome legs. The long-lasting brightly colored chairs will make your learning environment even more fun. Parents, teachers, and day care owners can use colors creatively. Assign teams for projects or dismiss your class according to chair color. Stability in a school stack chair is paramount, and with nylon swivel glides or matching ball glides, your chairs have a steady footing. The nylon swivel glides level chairs independently to create a stable learning environment. 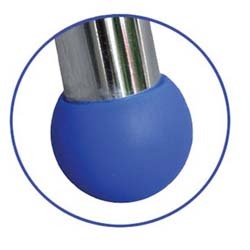 The sleek and classic choice both in appearance and longevity, nylon swivel glides are designed for use on hard surface floors. Not suited for thick, looped carpeting. ECR4Kids is committed to developing and distributing the highest quality classroom furniture and equipment. Their focus and commitment continues to be centered on value-added features, functionality and performance with their products while providing optimal service. With a concentration on the Pre K-12 sector, ECR4Kids offers a wide range of products from tables, chairs and desks to cots, mats and a variety of case-goods in solid wood as well as scratch resistant double-sided laminate. All ECR4Kids products have gone through rigorous testing for both safety and functionality from start to finish. Their products are GREENGUARD Certified for Children and Schools indoor air quality as well as CPSIA approved. This process and certifications assures parents, teachers and school administrators that ECR4Kids products are safe to use. Blue, red, yellow and green school stack chairs with your choice of matching powder coated legs or chrome legs with nylon swivel glides or matching ball glides; no assembly required.